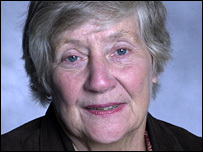 The Liberal Democrat peer Baroness Williams has said she would rather go to prison than carry an identity card. Baroness Williams said the cards would seriously undermine individual liberty so people were entitled to refuse their co-operation, using non-violent means. Speaking on BBC Radio 4's Any Questions, she described the plans as "a Big Brother scheme of the most terrifying kind". From 2010, all UK passport applicants will be issued with biometric ID cards. The £5.6bn scheme will also see the cards being brought in for foreign nationals from next year. The government says cards will help protect people from identity fraud, will tackle illegal working and illegal immigration, and disrupt criminals and terrorists' use of false identities and ensure free public services are only used by those entitled to them. But Baroness Williams said: "Because it is so expensive the government has proposed that it will sell our data to commercial interests who will then be able to track down every damn thing you do from dawn until dusk. "And you won't be able to escape from it because the ID card which will be checked against your credit card will be a record of exactly where you've been, what you've done, who you've talked to. "My view quite simply is that the ID card will undermine individual liberty so seriously that one's entitled to say one won't co-operate with it. "I have not suggested I would use violence. I am suggesting I wouldn't co-operate with it, nor will I." Asked whether that meant she would go to prison for breaking the law, she replied: "So be it - and I'm not suggesting any act of violence but we've got to not co-operate with something as bad as this." Nick Clegg, one of the party's leadership candidates, has also stated he would take part in a civil disobedience campaign against ID cards. Last month, he said if legislation were passed, he would lead a grassroots campaign of civil disobedience to thwart the programme and thousands of people would simply refuse to register.